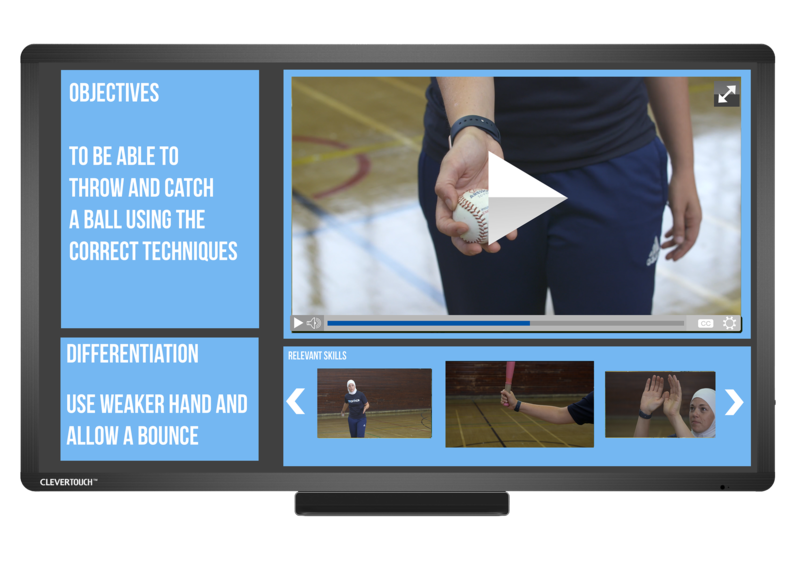 To deliver high-quality PE drills, lessons, sessions, games and long-term schemes we have created a platform for the Primary PE Teacher. We have extensive lesson plans, drills available for you to address the governments requirements regarding the Sports Premium for your PE delivery. Schools must use the funding to make additional and sustainable improvements to the quality of PE and sport within Primary Schools. Our Platform has the facility that all students can follow a virtual teacher teaching a lesson, drill, activity or game in their own time. Your teachers can simply follow the 600+ plans, 10,000+ drills and numerous animated drills to help assist in teaching and learning but create high-quality PE. The platform and lesson plans challenge all your learners. The learners can walk up and touch the screens and differentiate the drills and skills so that they are improving all the time. 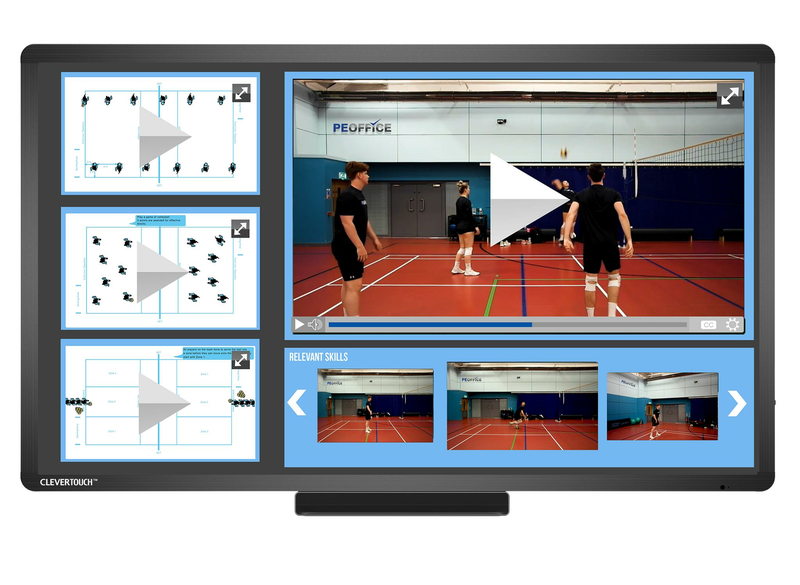 The Sports Premium Platform from the PE Office allows any teacher, student and non-specialists access to the lessons, skills, drills and CPD. 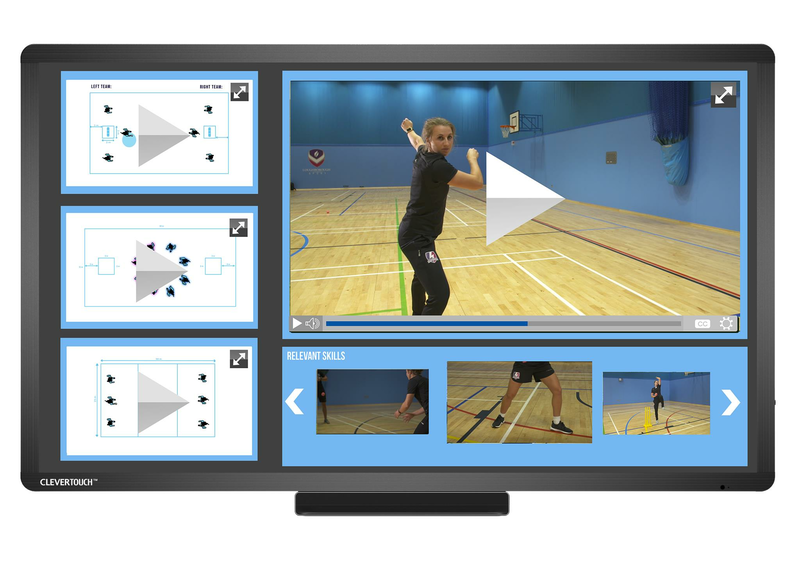 The package enables the perfect 'elite performer' who is the virtual teacher who virtually shows a range of sporting drills, activities, and exercises. The students and non-specialist teachers can follow the diagrams and animations and challenge themselves with the differentiated tasks. We have created a free School Sport Network area within the Platform so that you can create fixtures, leagues and competitions to increase participation and enhance competition against external schools both locally and nationally. We have user-friendly resources and descriptions that can be edited and tailored to the pupils' needs. Also, the pupils can literally walk up to the screen and follow the lesson. 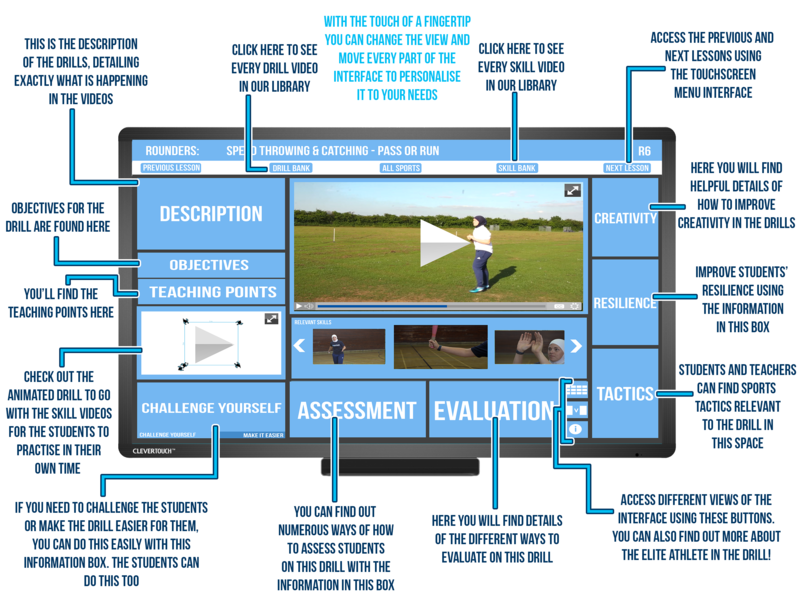 Why when we have brought everything in house for you to develop teaching in PE and deliver with the use of the virtual teacher and perfect model. We have a range of sports (above) which can be used. We are adding more video clips and skills as we speak. We have added a build your own section so that you can make multiple sporting hybrid activities or combine skills with animated drills and games. Every lesson can be created for every individual. We recommend and have created the screens so that pupils can approach the screens on numerous occasions and revisit any drill, animation or video of the perfect model. We are proud to state that we have a free school sport network to enable your pupils to compete and participate in fixtures, leagues and competition. You can also create mini leageus or tournaments regarding the ability for any sporting activity. We have incorporated leadership, coaching and officating roles and tasks within each drill, activity, lesson and scheme of work. We have swimming lesson plans, skills, drills and schemes of work - But unfortuantely we cannot bring the swimming pool to you! The touch screens can be wheeled out on their trolleys so that any pupil or group of learners in play time or PE lessons can follow and active plan, scheme, drill or game to create active playgrounds. The platform enables teachers to use the resources interactively so that the pupils view the perfect model and can go away and instantly perform. From this we have incorporated some analysis software (included in the platform) with assessment tools so that any pupil can compare their perfromances to that of the perfect model. 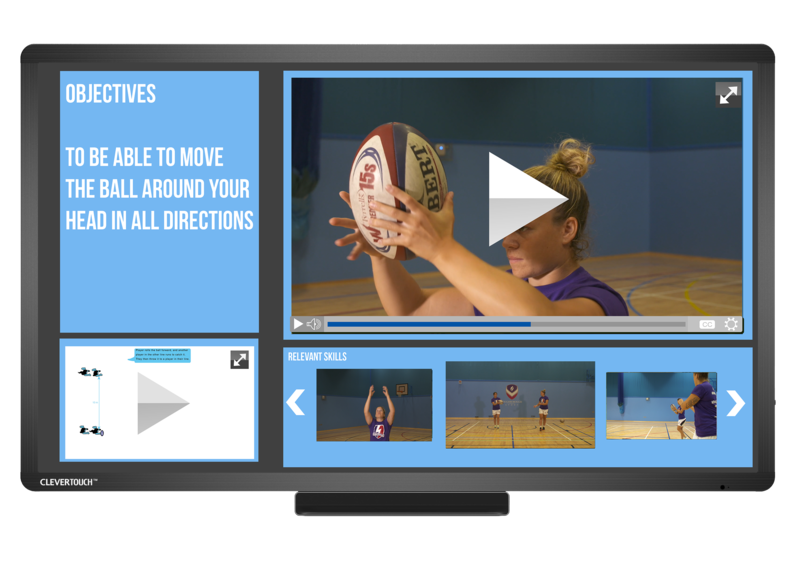 Our sports premium package enables every teacher and student access to the resources whilst being able to customise them on a big interactive touch screen to aid teaching and learning but most importantly a personalised learning environment. We wanted to provide the perfect model for those using our resources. We wanted all of the atheletes doing our practices, skills and drills to be elite performers so the next generation can learn from those that have achieved. We are proud to associate ourselves with the Athletes who all have a unique story and background... but most importantly want to raise awareness. We can do this together by using the PE Office Sport Premium. Justine is an English Rugby Union player. She represents England and made her debut in 2013. She was named in the 2017 Women's Rugby World Cup squad for England. Justine began her rugby career at the age of 20 in her final year at Loughborough University where she attained a degree in Sports Science and Maths. Katy (born 19 December 1985) is an English female rugby player, who was captain of England Women and captained them to victory against Canada in the 2014 France Rugby World Cup. She plays as a fly-half and plays club rugby for Loughborough Lightening. She received an MBE in the 2014 New Year Honours. Katy graduated from the University of Sunderland with a BSc Sports Studies in 2007. She works professionally as a schoolteacher. Our animated drills in the relevant skills areas enable the learners to select appropriate drills if the drills and task are too hard or too easy. 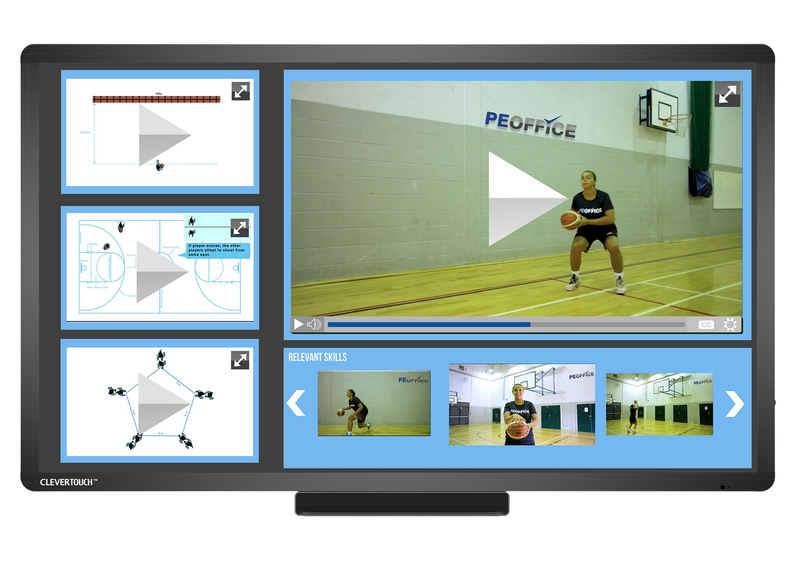 The PE Office Ltd was approached by Blue Box IT to work in conjunction using Clevertouch Technology so that we had an ultimate PE resource for Primary and Secondary PE sessions that used the perfect model (elite athletes) to deliver virtual teaching, skills, drills and planning within an innovative PE Virtual Learning Environment. So, Whatever is on the laptop can be on the screen (or vice versa). Assessment, Drills and plans can be shared uniquely so that all learners can follow one pathway or their own unique path. 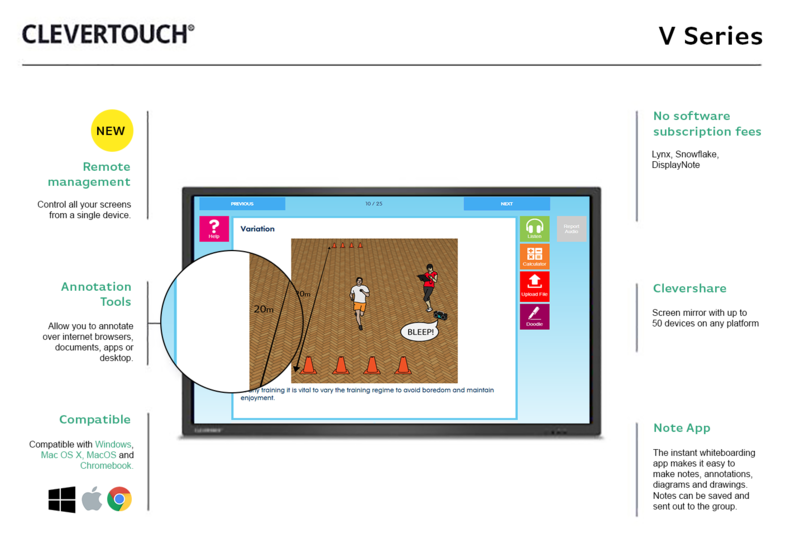 What is Clevertouch and how does it use the PE Office resources? The equiment and screens come with trolleys so that they can be used for lessons inside or outside. The screens are all interactive so that the lessons and plans can be built and edited by a specialist instantly. 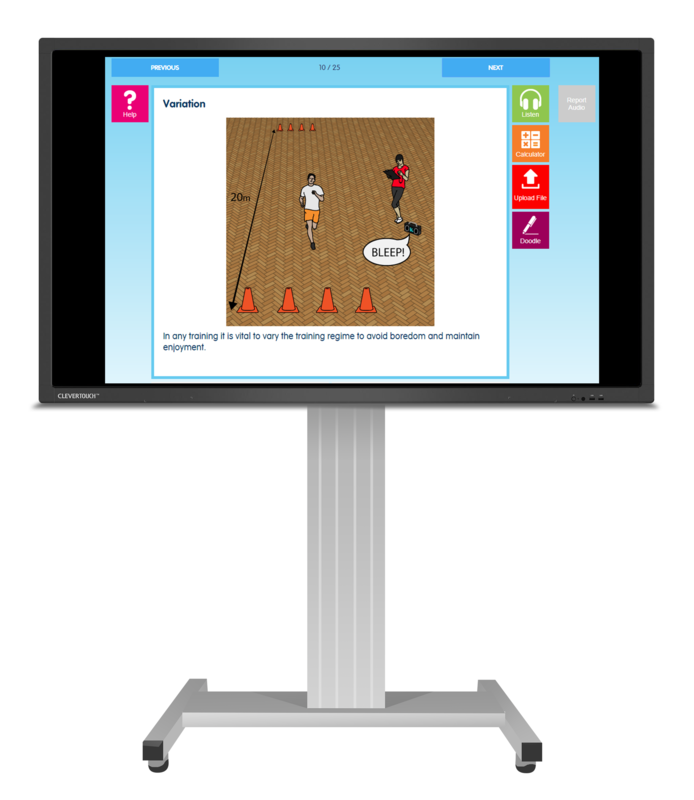 Students can walk up to the screens and use them for planning, assessment, coaching, and analysing theirs and others performances. - Supporting the PE Office with an interactive PE environment.